BROOKLINE, MA — Orthodox Christian Fellowship (OCF) is officially accepting resumes from interested candidates for the position of Executive Director. 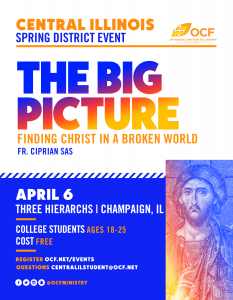 OCF is an agency of the Assembly of Canonical Orthodox Bishops of the United States and serves as the official campus ministry for the twelve (12) Orthodox Christian jurisdictions that the Assembly represents. Its mission is to transform the lives of college students in the United States and Canada by guiding them along the path to Jesus Christ through His Church, cultivating a campus community of worship, witness, service, fellowship, and education. Headquartered on the campus of Hellenic College Holy Cross Greek Orthodox School of Theology in Brookline, Massachusetts, and with a network of more than 400 chapters that stretches across the United States and Canada, OCF is seeking a motivated individual who can champion Orthodox campus ministry and oversee the operations of OCF’s regional and national programs. The candidate must demonstrate strong leadership ability, management skills, an ability to multitask, and an understanding of and respect for the practices, traditions, theology, and structure of the Orthodox Church. A resume indicating past work experience. Three (3) references of persons the candidate has worked with, along with the name and address of the organization, telephone number and email address (if available) for each person. At least one of these individuals must be a current and/or former manager or supervisor. One of these references should be from a member of the clergy – e.g., a jurisdictional hierarch, a spiritual father, and/or parish priest. A brief explanation (3-4 paragraphs) explaining the candidate’s interest in working with Orthodox Christian Fellowship and goals as the Executive Director. Applicants will be reviewed and contacted in May 2019. The targeted start date of the position is July 1, 2019. A full job description is available here. OCF also encourages you to learn more and to support the ongoing work of this vital ministry by visiting its website or emailing the OCF National Office (info@ocf.net).